JUNEAU -- Just after 6 a.m., a handful of cars drove down the ramp from the Juneau ferry dock into the MV LeConte for the ship’s twice-weekly loop through Angoon and nearby Tenakee Springs. There's no road to Angoon, a Tlingit village of 450, and there's no airport, either. To get there from Juneau, you can buy a one-way seaplane ticket for $160 – or spend $55 to ride the ferry. But Alaska Gov. Mike Dunleavy has taken aim at the ferry system’s budget, proposing sharp cuts that are threatening its future. A single trip on the LeConte last week showed how residents have knit the ships into their lives — and how they would adapt if the ferries stopped running. Upstairs, on the observation deck, Shayne Thompson was drinking a cup of coffee. The box truck was his; Thompson runs Angoon's store and puts supplies on the ferry every week. He said he remembers, as a child before regular ferry service, when food would come just once a month on a barge. "Everybody would grab it, and then we'd be out for three weeks. That's the way it would go – there was a lot of canned goods eaten then,” Thompson said. “We're able to live a little healthier lifestyle at this point, thanks to the ferry. And it's just fantastic." Dunleavy, a Republican, rode one of the state ferries from Washington to Ketchikan when he first arrived in the state, in 1983. And he was elected after saying there was “no plan to hack, cut or destroy” Alaska's ferry system. Dunleavy's administration said the proposal would save the state $100 million. The governor argues that steep cuts are needed to balance Alaska's budget, while at the same time paying larger cash dividends to residents. Ticket sales generate a little more than one-third of the money required to run the ferries. 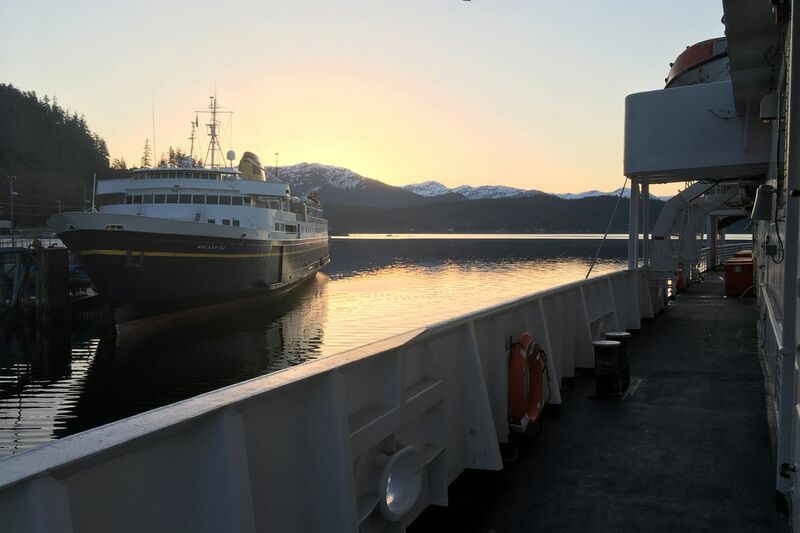 For the LeCounte’s Angoon trip, fares would have to be five times higher — about $300 — for the route to pay for itself, according to an analysis provided by Dunleavy’s office. Alaska operates nearly a dozen ferries, and they're particularly indispensable in Southeast, a 300-mile long archipelago where only a few towns are connected to the road system. Schools use the ferries to move sports teams. When cars need maintenance, people float them to mechanics in Juneau. Sick people who have a hard time loading into bush planes ride ferries to doctor's appointments. The ships even carry the bodies of elders back to their hometowns. Southeast Alaskans note that the ferry system is called the “marine highway,” and they have a comeback ready for people who question its cost: People in Anchorage and Wasilla, Dunleavy’s hometown, don't pay for plowing or maintenance on their state highways, either. Stedman spoke just after a long meeting with Ben Stevens, Dunleavy’s policy advisor tasked with reshaping the state ferry system. Stedman said he's trying to work with the Dunleavy administration on a temporary plan to keep the ferries running, even if they're running less often, until lawmakers can agree on a longer-term vision for the system. Like others, he was already thinking about how he'd cope if the ferry runs less often. Frank said he's looking for a new skiff, for harvesting seaweed and fishing for halibut and king salmon.